I have at least 25-30 pairs of shoes, and sometimes I think that's too many because I only have two feet. But I guess "too many" is ultimately dictated by budget and storage space, no? 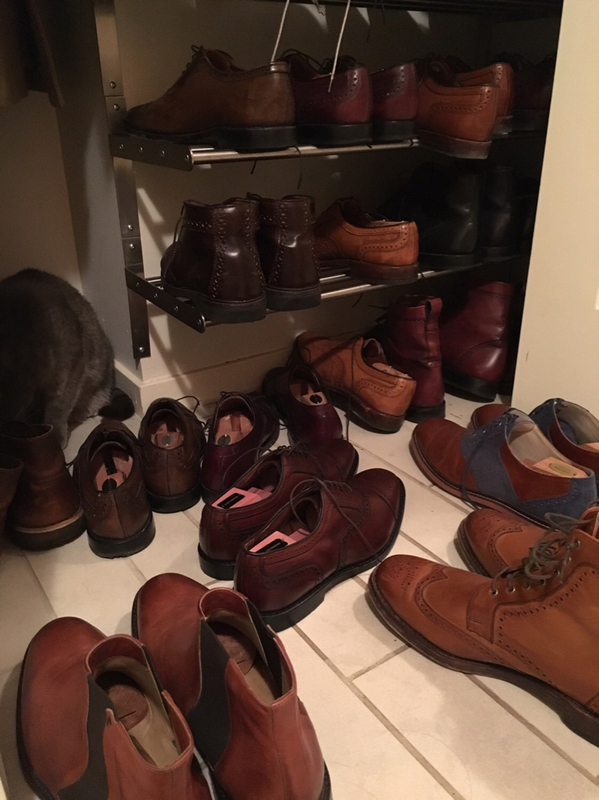 My wife has around 200 pairs, I think. I put a couple of cabinets in the garage for her 50-60 pairs of boots. She rarely wears most of them, but she doesn't think she has "too many." Oh, by the way, although it might seem counter-intuitive, I've found that storing the shoes in the boxes, inside of bags, allows for more shoes in the same space. That's because if they are in dust bags, they can overlap each other without damaging them. I have 41 pairs of shoes. I sold 3 pairs in the last year and picked up 3 more. It is way too many. I want to get rid of some more, but price and shipping doesnt seem like it would be worth it to me, so I keep them. I may donate some soon as I know there are pairs I will never wear again. I did the same thing with shirts and suits. One I got my size dialed-in I went full-dummy and overboard. I need to purge my entire wardrobe. I have clothing fatigue when picking out what to wear. I am about to purge 8-10 pair, and I still have too many. I have been able to post in What Shoes are You Wearing Today without duplication, so far. Oh, you have some great shoes. You wouldn't happen to wear 12 or 13, do you? You might have a buyer for one or two pairs if you're looking to sell. Around 4 pairs in my daily rotation. Something fuzzy in the corner. Cat? I am a fighting a recent shoe addiction. I don't think there is a maximum. My wife has about 100 pairs more then I do so I have a long way to go to catch up. Dress shoes like 5 pairs. I prefer to wear them out and replace versus having tons.